Nikolai Belyaev was born into a working class family in either 1898 or 1900 In Tula. This city lies 120 miles south of Moscow and at the beginning of the 20th century expanded rapidly thanks to the manufacture of guns and other materiel. Belyaev received a primary education, and according to one Chekist report, was illiterate. In summer and autumn of 1919 Yasha Glagzon, a native of Tula who had fought with the Makhnovists and had been in the Makhnovist Kontrravezda, returned to Tula. Here he began to construct an Anarchist Underground along with Nikolai Belyaev and others. This underground worked closely with Left SRS and with Maximalists led by Sasha Rozanov. In fact Belyaev had himself been a Maximalist from 1917 but moved over to the Tula Anarchist Federation in 1918. The Anarchist Underground carried out several large expropriations in alliance with Left SRs and Maximalists and Belyaev appears to have acted as quartermaster of the group’s weapons which included a machine gun, 100 rifles and bombs. However, he appears to have had disagreements with members of the Anarchist Underground and resigned from the group, although continuing to hold the group’s weaponry. The Cheka came down heavily on the Anarchist Underground after the bomb attack on Communist Party headquarters at Leontievsky Street in Moscow and the subsequent deaths of Glazgon and other leading lights of the Anarchist Underground like Kovalevich and Sobolev. Belyaev himself was arrested in Samara in November 1919 and sentenced to five years in a concentration camp on January 30th 1920. He was imprisoned in the Clock Tower of the Butirky prison with other anarchists. On the night of April 25th-26th 1921 at 4 am a large squad of Chekists and Red Army soldiers entered both male and female sections of the prison. Menshevik and SR prisoners were beaten with fists and rifle butts and some were dragged naked down stairs by their hair. In the Clock Tower, Belyaev and two other anarchists, V. Prosenko and Nikolai Timakov, thought they were going to be shot and put up a fierce resistance and were beaten brutally. The whole operation was carried out under the supervision of the highest Cheka officials, Belenky, Khozhevnikov and the anarchist renegade Samsonov. On 27th September 1921 Belyaev made an armed escape from Oryol Prison but was apprehended on October 21st at Romny in Poltava province. He again made an armed attempt from Lefortovo prison but was caught again. He was sentenced to 1 year in a concentration camp at Solovki in March 1923, In November he was transferred to Kem and again in January 1924 to Lubyanka prison. In March 1924 at the end of his sentence he was exiled to Arkhangelsk and the following year because of his correspondence with anarchists outside the Soviet Union he was moved to Turkestan. In November 1926 he was again arrested at Kzyl-Orda in the Kazakh Republic (now Kyzylorda) along with A.V. Pankratov on the charges of anti-Soviet propaganda. The cause of their arrest was their protest against the hypocrisy of the Soviet authorities at the official rally for the Italian American anarchists Sacco and Vanzetti who had just received death sentences from the US authorities. Belyaev were revolted by the fact that this was taking place whilst many anarchists in the Soviet Union were being persecuted, imprisoned and murdered. They also objected to the obscene gesture of a nearby military airfield being named after Sacco and Vanzetti. After their arrest, Belyaev and Pankratov held an eight day hunger strike. In December 1927, the OGPU handed out a new 3 year exile to the two anarchists. In 1932 Belyaev was sentenced to a further three years in a political isolator on charges of anarchism and anti-Soviet agitation. Upon his release he worked as a turner at the power plant in Minusinsk. Belyaev was again arrested on November 6th, 1935. He was released on January 21st, 1936. He was again arrested on June 30th, 193. 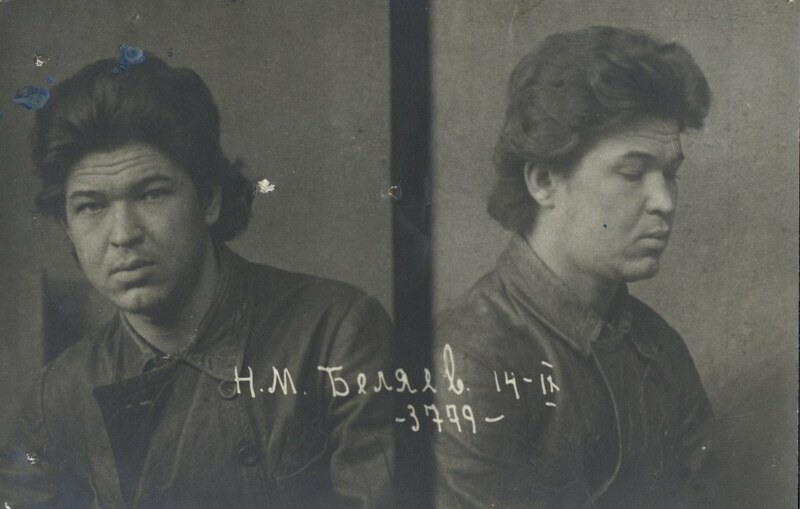 He was sentenced to death on August 13th 1937 for the creation of an anarchist group in Minusinsk and the intention of creating a militant terrorist organisation. He was shot on the same day along with fellow anarchist Aron Kopelevich Volchenok (born 1902).